When I was in graduate school, I was a part of the Tallahassee Equality Action Ministry (TEAM), an interfaith direct action movement that brought together religious organizations to work for social justice in the local community. I joined up because the church I was attending then was actively involved; I stayed because I cared about the problems TEAM planned to address: homelessness, health care and universal pre-kindergarten. TEAM tried to make Tallahassee a better place to live for everyone who lived there. At 25, I ended up taking lead of TEAM's push for universal voluntary pre-kindergarten (VPK). We were part of a statewide campaign that proved successful in getting free VPK for all 4- and 5-year-old kids who live in Florida. If you had asked me all those years ago if I was an activist, I would have probably told you “no.” It took me a very long time to realize that what I was doing was activism, actions geared to bring about cultural or political change. It took me years to accept the label of activist. After all, activism has a bad rap in some circles of higher ed. Some of my professors sneered at scholars whose scholarship had an activist agenda, while others dismissed the work of scholar activists as biased or too political. Somehow, the desire to change the world seemed to be bad for scholarship, so I pretended that my academic work was distinct from my participation in TEAM. Activism was safely separated from scholarship. And yet, my dissertation, and later book, was about white nationalism and the dangers it posed past and present. Even if I refused to notice, my writing was always a part of my activism. I wrote to make the world a better place. Attending the NASPA conference made me think again of my own activism and activism more generally in higher ed. At NASPA, activism wasn't scorned or attacked, but welcomed. Activism appeared as strength, not weakness. In a NASPA conference session entitled “Career Coaching for Student Activists,” Elizabeth Simmons and Melissa Whatley from the University of Alabama at Birmingham, made the case that activism prepares students for both their future careers and lives (yes, yes, yes!). Whatley emphasized that while the long-standing career advice for students was to keep activism separate from work, that's no longer an option. Simmons noted, “Activists are fighting for survival … and activists are fearing for their own future.” Student protests and other direct actions on campus require planning, organizing, leading and communicating, all skills that will serve students well in the workplace. Many of the students Whatley and Simmons work with in career services don't imagine what they are doing as activism, but instead they found problems on campus that needed to be fixed. The skills students learn while being activists also improve their lives. Through activism, students learned to diagnose social problems, build community, engage in open dialogue, find common purpose among conflicting groups and create policies that demand equality. Their activism gave them tools to better engage the world as critically engaged citizens. The work of their activism was directed toward making their campuses and communities into more equitable places. One of the NASPA conference's featured speakers was Bree Newsome, a community organizer and activist who took down the Confederate flag at the South Carolina State House in 2015. Newsome described her awakening to organizing in 2013, which began with a tour of a South Carolina slave market. Activism, however, doesn't always mean being on the frontline. A movement, Newsome explained, is “millions of people doing millions of things in millions of places.” Making change requires actions, both big and small, to change the structures of oppression in our world. The work of activism requires action without ever knowing the outcome. All those years ago, I had no idea that working with TEAM would get the VPK bill passed; that my daughter would attend universal VPK in 2013, eight long years after my work with TEAM was through; or that my son will attend VPK in a little over a year. I didn't know that my actions with TEAM would change anything, but I hoped they would. And they did. 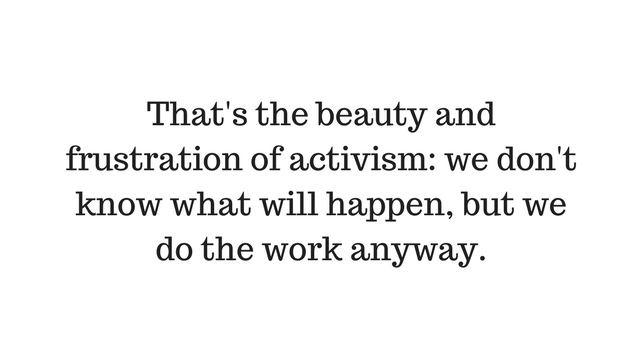 That's the beauty and frustration of activism: we don't know what will happen, but we do the work anyway. So, readers, do the work of activism to change the future. We never know what will tip the balance, but it might be what you do.